New fabrics, 2016 classes, Thistle Dew remodel! we will be OPEN on Monday, October 12. Halloween and Fall fabrics are now 25% off!!!! almost 2 months to make Fall and Thanksgiving projects. With this price reduction, these fabrics will be selling quickly, so don't put off getting that beautiful seasonal fabric you've been coveting. The Fair Oaks Safe Halloween is Friday, October 30, 11:00 a.m. - 4:00 p.m. There will be trick-or-treating in the Village and Thistle Dew will again be hosting a reading station in our classroom. Bring your little ones to gather goodies and hear a fun Halloween story. We will be closed October 25-27 for some remodeling. We're getting new floors installed and moving things around. As part of this process, we want to get rid of some inventory, so there's less to move. So be sure to check your email in the next 3 weeks to find out what's on sale. We'll be adding lots of fabric to the sale area during the next week. Janet Paehlig of Tenaj Creations has her beads and fibers at Thistle Dew (in the classroom) today through next Tuesday, Oct 13. These are amazing additions for embellishing projects, so be sure to come in and see all these treasures. Tues, Oct 13, 9:00 a.m. - noon -OR- 1:00 - 4:00 p.m.
Blankets for Preemies, Fri, Oct 16, 11:00 a.m. - 3:00 p.m.
Handwork Sit & Sew, Mon, Oct 19, 10:00 a.m. - 4:30 p.m.
American Girl Doll Sit & Sew, Thu, Oct 22, 1:00 - 4:00 p.m.
Baltimore Album, Sat, Oct 24, 10:00 a.m. - 2:00 p.m.
Four-Patch Chain BOM (full), Thu, Nov 5, -OR- Sat, Nov 7, 10:15 a.m. - 10:45 a.m.
Crimson Tweed, Judy Cummings, 2nd Mon, Jan-Jul 2016 (no class in Feb), $90 for six sessions, supply list. 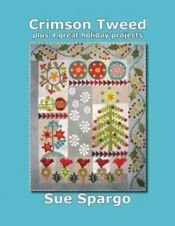 Another amazing Sue Spargo wool applique and embellishment project; this one with a Christmas theme. 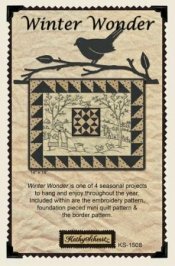 Judy will be your guide as you make the center motifs of Sue's holiday wallhanging (snowflakes and Christmas tree). You will then have the skills to complete the entire wallhanging, if you want! 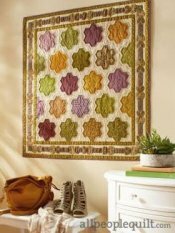 Quilters' University 2016 - Beginning, Judy Cummings, 3rd Wed of each month, 9:00 a.m. - noon, beginnig Jan 20, 2016, $15/class. (Students must pay for 4 classes at a time - $60.) These sessions are for very beginning quilters -- those who have never quilted before. 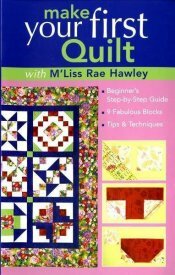 You will use the book Make Your First Quilt by M'Liss Rae Hawley to learn the basics of quilting and make a sampler quilt. 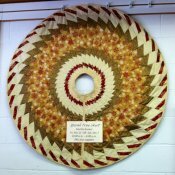 In addition, we now have several ginghams, more ‘solid’ batiks, new solids, and more. You’ll just have to come in to see them all. you get 10% off that fabric! Every day!